This is a really lightweight sunscreen that’s supposed to give skin a soft, smooth finish. It provides SPF50 (or PA+++) of broad spectrum protection. The sunscreen also includes some antioxidants to protect the skin. Also, I like the added silicone and silica ingredients, as these ingredients usually work well as a makeup base. I ran the ingredients through cosdna.com, and the only ingredient that came up as a moderate acne-trigger is stearic acid, but it’s lower on the list of ingredients so I’m fine with it. In fact, it’s been hard for me to find any sunscreens with such a mild formula that’s ok with my sensitive, acne-prone skin. Even after using this for a month, it didn’t break me out. The only issue I have with the formula is that I wish this was waterproof. This sunscreen comes in two different sizes: 40 ml and 70ml. I bought the 70 ml on koreadepart.com for only around $13, plus shipping. 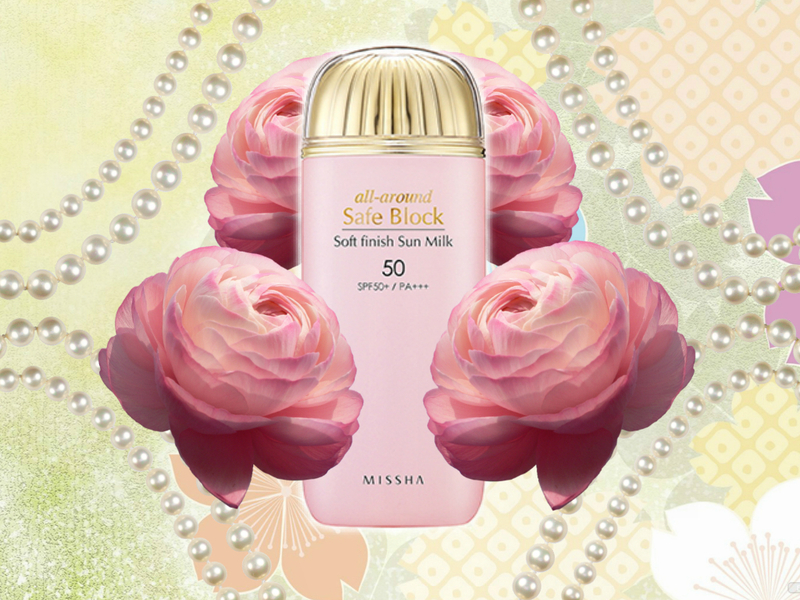 But I’ve since seen it on sale on Missha’s U.S. site, so I’ll be purchasing it from there from now on. It’s a really great value for the price because a little bit definitely goes a long way with this product. As you can see, “milk” is a good way to describe this sunscreen. It’s very light, and almost liquid. I like the fact that it’s liquid because it spreads really easily and you don’t need much product to really spread a good amount over your face. It’s slightly pink in color, with a light floral smell. Surprisingly, this sunscreen doesn’t have much of a typical sunscreen smell. It also absorbs really quickly into the skin, usually in less than 15 seconds. Just for reference, I had spread the sun milk only on the right side of my hand. 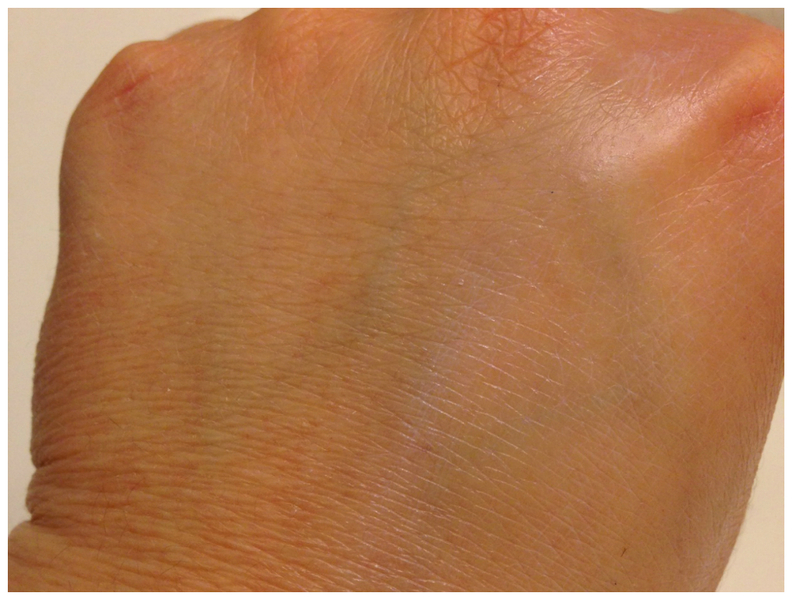 Even though I had put a lot of product on my hand, you can see that it absorbed really well with little trace. It does leave my skin nice and soft, with a slight powdery finish that covers up the fine lines on my hand. The powder finish also does a good job of diminishing my enlarged pores to make my skin look a little smoother. A couple things I noticed that I didn’t like at first was that the powder finish 1) left my skin color slightly lighter and pinker in appearance, and 2) didn’t blend well with my makeup. So first, even though I don’t put too much on my face, it still leaves my skin lighter and ever so slightly pinker in appearance. This isn’t the typical white cast left by sunscreens, but this is more from the powder finish that makes my skin lighter. It’s the same effect I’ve noticed from primers that also leave a powder finish. And second, the powder finish makes it difficult for my BB cream to blend nicely on top of the sunscreen. The BB cream doesn’t spread as nicely, and I notice the powder from the sunscreen collecting in my pores. And worst, it made my BB cream look like a mask. So, as for the first issue (of making my skin lighter and pinker), I can live with it. I actually like the way it diminishes my pores, and the lightening effect is so slight, that it doesn’t really bother me. But I’m sure people with darker skin than I may have a problem with it. And as for the second issue (of not working well with my BB cream), I learned how to solve this problem. 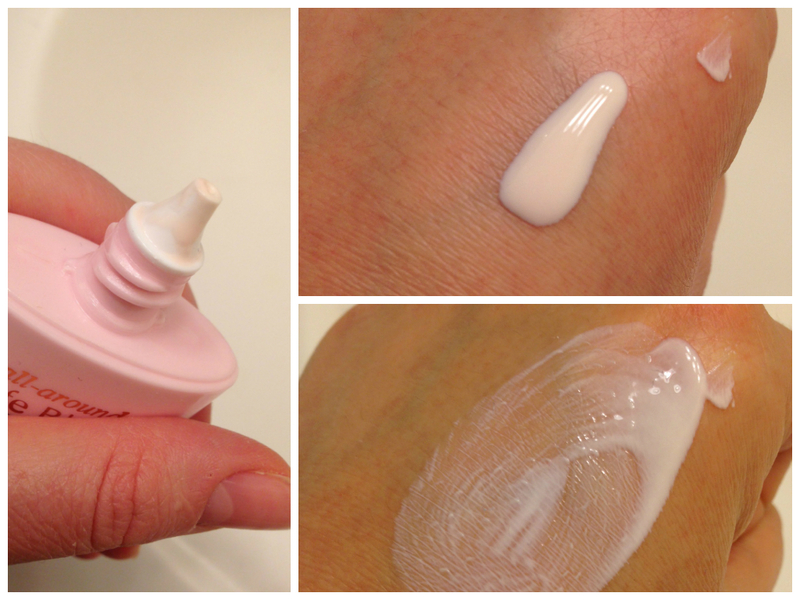 I mix the sunscreen and BB together, and I love the way it looks on my skin. I do this by first spreading a little bit of sunscreen on one part of my face (like the forehead), and before the sunscreen dries, I spread a little bit of BB cream on top, rubbing it together until it dries. Then I follow up in the same way on the other parts of my face and neck. I do it this way to better control the amount of sunscreen and BB cream ratio. It leaves my skin looking dewy and totally natural, diminishes my pores, evens my skin tone, but it also doesn’t look like I’m wearing makeup. I really love the way the mixture of this sun milk with my BB cream work together to make my skin looking bright and healthy. I’m really impressed with this sun milk. With its SPF50, it provides great coverage. Unfortunately, it’s not waterproof, so I’ll have to use a different one for when I exercise. It does leave my skin looking softer with diminished pores, and I like that I can leave the house with just this sunscreen if I want to and not feel completely self-conscious. But, it does leave the skin slightly lighter and pinker in color, which may be a problem for some. And I did have a hard time figuring out how to blend this well with my makeup. But in the end, I got this to work well for my skin and I really like it! Pros: Works as it should, effective at diminishing pores and lines to leave a soft finish, leaves my skin looking bright and flawless once I learned how to mix it well with my BB cream. Cons: Leaves skin slightly lighter and pinker in color, took a bit of experimentation to make it work well with my makeup.